Three years ago, when Fang Hao (pseudonym) and his wife decided to adopt a Labrador puppy from a friend in Beijing, they found out just how difficult it was to bring the pet to Shanghai. "Ten hours of traveling is torture for a puppy, and pets are banned on high-speed trains," recalled Fang. "Although airlines provide pet transportation in a box with oxygen, they cannot guarantee the proper temperature and humidity." After careful consideration, Fang and his wife decided to rent a jet. Fang is just one of the massive numbers of people in China passionate about their pets. Another report released by CBNData shows that young people born after the 1990s have become a major force in China's "pet economy." Jia Yu, the owner of three bichon frise dogs, Taotao, Xiuxiu and Niuniu, said that she has never thought about how much she spends on her dogs each month. 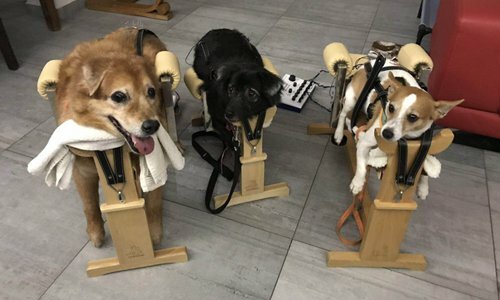 "I take them for pet grooming once a month and a bath twice a month, which costs about 2,400 yuan ($350) in total," Jia told the Global Times. "I take them to a spa every three or four months, which is 400 yuan per dog, and oral care costs 100 yuan." "Normal dog food sold in the supermarket is too oily and causes dog obesity and diarrhea," said Jia. Jia said she spends 600 to 700 yuan on dog food every month. "As suggested by a vet friend, I bought a kind of dog food which is a little more expensive than what you find in the supermarket." Jia spends 34,500 yuan every year on food and grooming for her three dogs, and that does not include pet snacks and decorations. In addition to this, she has to keep the air conditioner on all year round to ensure that the dogs live in comfortable surroundings. Wang Ke, a cat owner, never trusts cat food in the market, and instead prefers to cook food for his cat himself. Salmon, chicken breast are his cat's favorite. Last year, he spent 3,500 yuan on a hair drier for the cat without any hesitation. "I am just trying my best to provide him as good a life as possible because this little creature is going to spend his whole life with me, and to him, I am the only person he can rely on in this world," said Wang. According to data released by the National Bureau of Statistics, the country's pet industry saw a compound growth rate of 49.1 percent from 2010 to 2016, topping other industries in China. The pet industry boom in China has also resulted in the rapid growth of veterinary medicine. Veterinarians have become the highest earning professionals out of the 800 vocations in China's major cities, followed by fitness instructors, according to a report by Zhilian, one of China's main recruitment websites. Jia Xiaolin, a veterinarian at the Meilian Zhonghe Veterinary Hospital, told the Global Times that the hospital has seen a significant rise in business volume and his income has increased. As young people born after 1995 have become a major force of their customer group, the hospital brought in a lot of new equipment including a CT scanner, MRI and hyperbaric oxygen chamber. Additionally, the hospital has also set up more clinics to provide professional services to satisfy the growing demand of their young customers, the veterinarian said. Some pet owners have also turned to acupuncture to treat their beloved dogs and cats. 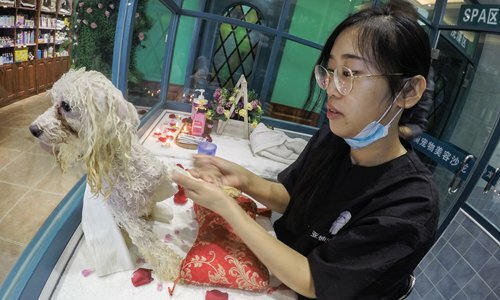 "Dog owners come to us from across the country, and most of them are young people," said Jin Rishan, owner of an animal acupuncture clinic in East China's Shanghai Municipality. Jin told the Global Times that a seven-day treatment course costs at least 2,100 yuan. Despite the high price, many customers still require more services to preserve their pets' health and prevent potential illness, as Jin's clinic currently only provides medical treatment. Besides superior living conditions, young Chinese pet owners are also spending their energy pursuing better spiritual lives for their pets. Life Travel, a Hong Kong based travel agency that provides high-end customized international trips for tourists and their pets, told the Global Times that they are tempted by the huge potential offered by the "pet economy" in the mainland and planning to enter the Chinese mainland market.